Environmental science is a holistic and multidisciplinary field that integrates biological, physical and earth sciences. Environmental scientists research environmental and health problems to identify their causes and come up with solutions to minimize or eliminate them. They also conduct theoretical research to increase our understanding of how the natural world works. Because careers in environmental science are so varied, it’s difficult to consider them as one category. Many begin their careers as environmental technicians or research assistants, working their way up to supervisory positions over time. Most entry-level jobs require a bachelor’s degree in environmental science or a related field such as microbiology or engineering. A master’s degree may be required for advancement. Tuition for a bachelor's degree program can range anywhere from $6,000 to $75,000 per year depending on the school and program. Two-year master’s degree programs typically range anywhere from $10,000 to $75,000 per year. Every day an environmental scientist goes into work, their ultimate goal is to protect the environment. 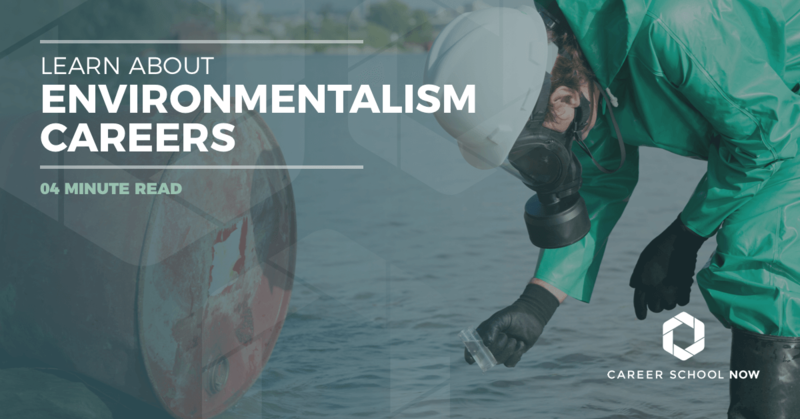 Environmental scientists look for ways to decrease or eliminate the negative effects of harmful pollutants in order to protect the environment and the health of the population. A degree in environmental science offers a broad approach to natural sciences and allows individuals to find work opportunities with ease. For most entry-level jobs, environmental scientists must have a bachelor’s degree in environmental science or a related field. A degree in environmental science offers a broad approach to the natural sciences, with courses in biology, chemistry, geology, and physics. Some may choose to take specialized courses in hydrology, waste management, and fluid mechanics. Classes in environmental policy and regulation may also be beneficial. Some graduates choose to embark on an advanced study program to train for a particular career path, teaching or management. Others are supported by their employer to gain relevant professional qualifications. Studying at a postgraduate level enhances your employability by increasing your research skills, specialist knowledge and communication skills. Postgraduate programs are aimed at developing knowledge of a particular specialist area of entering the sector, such as environmental health. Upon graduation, it is relatively easy to find work experience opportunities. There are many environmental organizations that need help from people willing to carry out unpaid work. Many students get involved in clubs and societies or take up volunteering roles with conservation organizations. Students should look for opportunities, such as classes and internships, that allow for work with computer modeling, data analysis, and geographic information systems. Environmental scientists analyze environmental problems and develop solutions. Others assess the risks that new construction projects pose to the environment and make recommendations to governments and businesses on how to minimize the environmental impact of these projects. Environmental scientists do research and provide advice on manufacturing practices. Environmental scientists often begin their careers as field analysts, research assistants, or technicians in laboratories and offices. With experience, they will get more difficult assignments and eventually move into a supervisory role. They may eventually move on to project leader, program manager, or other management or research positions. In addition to the technical skills, an environmental scientist needs certain skills to succeed in the field. Good communication skills, including speaking, listening and writing abilities, are important when sharing research findings with colleagues. An environmental scientist also needs good critical thinking skills to weigh possible solutions to problems and to pick which one will be successful. Online degree programs allow students the flexibility to shape their degrees around individual career goals, interests, and passions. For students looking to enter the field of environmental science, a bachelor’s degree is typically the minimum education required. Students in online environmental science programs will complete coursework in areas like biology, geology, oceanography, geographic information systems ethics and public policy. Online bachelor’s degree in environmental science are based on foundations in natural and physical sciences, allowing students to gain the broad-based interdisciplinary skill set that companies look for to solve complex environmental and business problems. While many of the general education courses can be completed at a distance, there are still lab and design courses that must be attended on campus. Also most online degree programs include an internship or capstone project. Students interested in online bachelor’s degree programs in environmental science should make sure the program is accredited by the Accreditation Board for Engineering and Technology (ABET). Accreditation by ABET not only marks high-quality programs but will ensure students are eligible to become licensed environmental engineers in their state should their career path require that credential.